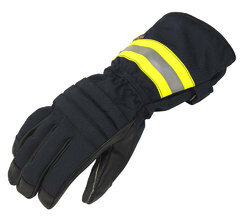 Pioneers in the industry, we offer para aramid gloves (kevlar gloves), safety gloves, protective gloves, flame resistant gloves, fire gloves and heat resistant gloves from India. 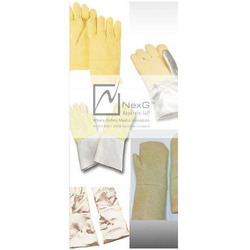 We have Para Aramid Gloves which can upto 800 - 1000 Deg C with some special insulations. 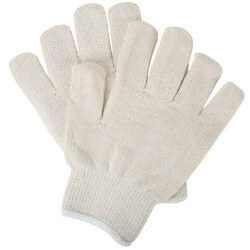 We have gained expertise in domain by offering a wide assortment of Safety Gloves. These products are highly praised by the clients for their durable and reliable use. The offered products are suitable while working in industry and known for having fine grip. Moreover, to meet the requirements of clients we test these products under rigorous checks. We are considered a well known name in the market that engages in manufacturing of Protective Gloves that are procured from our dependable vendors of long term. Offered in different colors and sizes, these gloves are appreciated for their skin friendliness, superb fitting, maximum comfort and lightweight. The proffered batch is provided in standardized packaging. 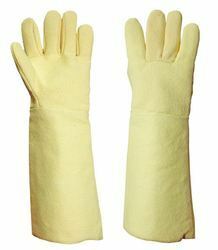 We make Para Aramid Gloves , Leather Para Aramid Gloves, Extreme Temperature Gloves, Aluminised Kevlar Gloves, Kevlar Gloves, Aluminised Gloves. Mitts. 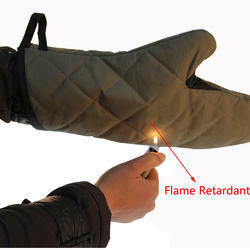 Extreme Temperature Gloves can sustain upto 1500o C.
These shoes enable complete protection from fire injuries with their external and internal cushion guards. These are also very comfortable to wear and available in standard sizes. The use of high quality aluminum material makes these shoes strong and wear resistant. These products are highly praised by the clients for their durable and reliable use. The offered products are suitable while working in industry and known for having fine grip. Moreover, to meet the requirements of clients we test these products under rigorous checks.